We're going for a walk, down here under the dieing buddleia. It's September 8th and, wherever you look - blackberries. Ahead, you can see Portland Harbour (part of the English Channel) a sailing club and a castle built in the time of Henry VIII. Who would not want to walk here? Rosebay Willow Herb is turning to seed. A new blackberry arch bends its way into the picture. There are flowers still on the wild clematis and the blackberries behind assure you it's September, not June. 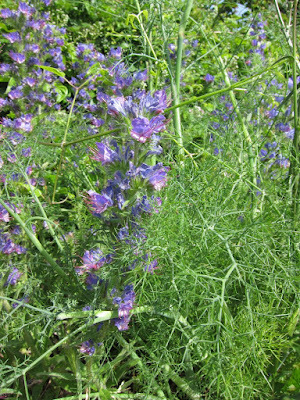 (They were flowering then too.) In summer they are called 'Traveller's Joy'. Now nearly all have exploded like popcorn into massive seedheads and they've moved to their next name - 'Old Man's Beard'. Soon, these froths will deteriorate into horrible mounds of grey, science-fiction-like, Miss-Havisham's-room-like mess and it will cover the bushes as clingy as tarpaulins. 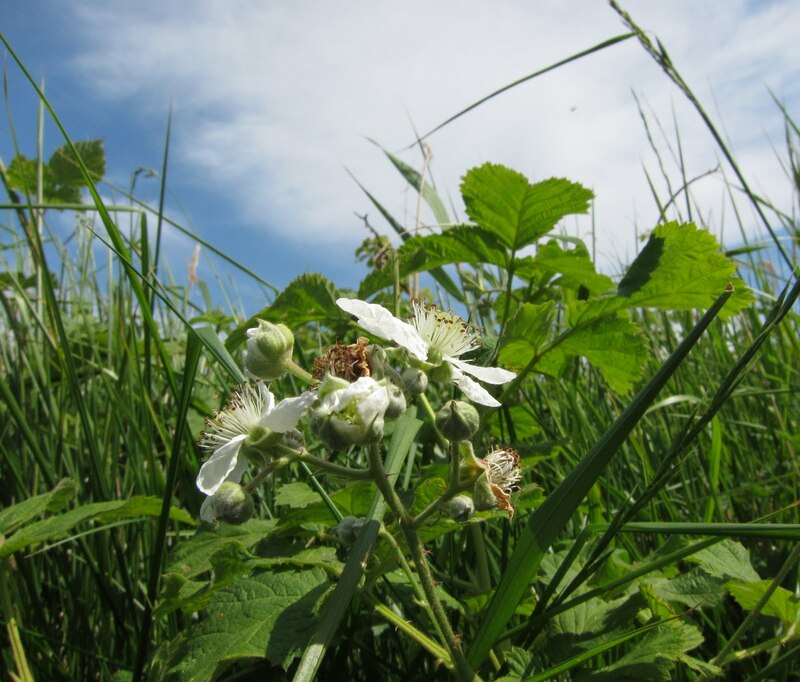 At the beginning of June, blackberry flowers looked like this. Pretty and delicate. Now they are turned to fruit; lumpy and bumpy and not entirely pleasant up close - though wonderful to eat. Here's a group in all its stages; green, yellow, orange, red, black. A store cupboard of extended ripening. 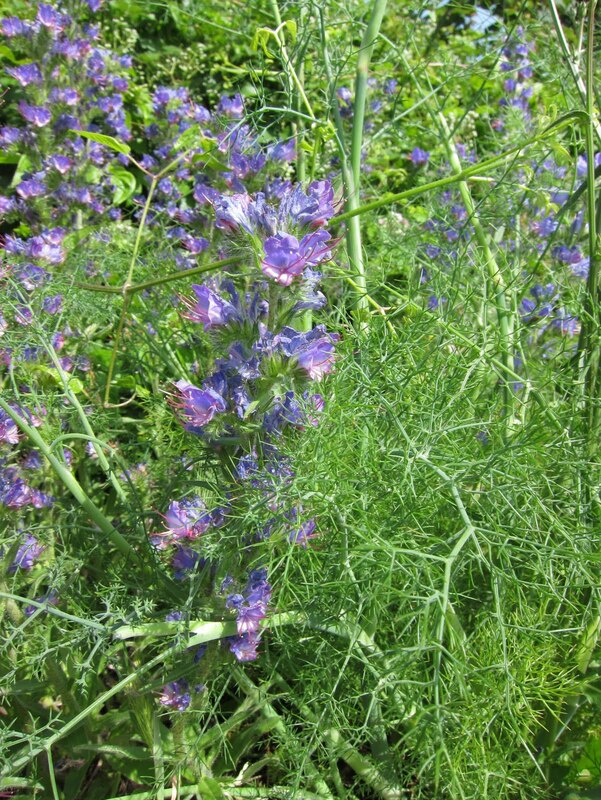 This was Viper's Bugloss and Fennel at the top of the path on 30th June. - silver or grey, intricate or tatty, depending on your mood when you see it. The seeds are small and tucked into tight cups which were, until very recently, upright and almost impossible to see inside. (I found them completely impossible to photograph!) Now we can just about make them out as little and dark but they still aren't sociable seeds, because there are tiny, hurting hairs to protect them. One minute down. One minute up. Three months in two minutes. Thank you for this wonderful ramble through the English countryside. What gorgeous photographs! I look forward to visiting often! What a wonderful walk. I love seeing what's growing along the way. To answer your question about my skywatch shot, I think the bird was a seagull. It was so far away that it was hard to see. Time goes so fast Lucy. Summer is definitely waning here. Wasn't it only two minutes ago it had just begun? I love all kinds of berries even though the seeds can be bothersome. Blackberries are one of my favorites. love seeing the way things change. How can a tough buddleia die? Love the walk in two minutes, would love to do it for real. It's oh so difficult keeping up with my friends Lucy and Esther! You're photographs always amaze me! Spectacular!! I like coastal path walks and that looks as if it would be a fine one to take. Isn't it amazing what happens in the course of but a few weeks? Your mention of Miss Havisham in relation to the clematis seedheads bought a smile to my face . I'm glad you liked the wander down the path. Looking back at the photos from this post, and having just published the next one, I see how bright and pleasant the light was. We are tipping into duller weather now. Noticing what one is passing makes even a short walk seem quite a long way, so much is packed in. The blackberries, which were still brilliant when I posted this, are effectively over now. The rain has done for them. You are right to say buddleia are tough. I wasn't meaning the plant / tree is dying - but the flowers on it. Monica - maybe one day you will be able to do this walk 'for real' ! It's nice to hear from you, even if infrequently! I'm glad you came here to visit too. Hello Viola - fewer flowers but non-stop nature. We are fortunate in that almost every walk along the coast here is pleasant - sometimes the routes can take one through dramatic scenery. This little path leads down to an Enid Blyton, Famous Five style beach.